A man suffered serious multiple stab wounds during an incident at The Boulevard in Crawley last night, police have confirmed. The road remains closed today with police issuing an urgent appeal for witnesses as inquires continue into the incident at 11.35pm. A police spokesperson said: “The victim, a 24-year-old local man, was flown by air ambulance to St George’s Hospital in London, with significant injuries. His condition is critical. Anyone who may have the vehicle seen it or the direction it was travelling in is asked to get in touch immediately. 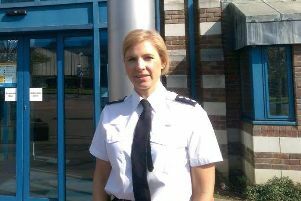 Chief Inspector Rosie Ross, Crawley district police commander, said the possibility of the attack being drug-related had not been ruled out. She said: “Criminality that puts people’s lives at risk is never acceptable and it’s vital that the community now pulls together to help us deal with those responsible. Police can be contacted in strict confidence either online or by phoning 101, quoting Operation Andes.